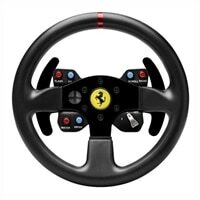 Thrustmaster Ferrari 458 Challenge - steering wheel add-onDetachable FERRARI 458 CHALLENGE replica wheel for T500 RS, T300RS, T300 Ferrari GTE, TX Racing Wheel Ferrari 458 Italia Edition. Reinforced rubber texture on the wheel’s entire circumference. Brushed metal central spokes (2 mm thick) with metallic paint Weighs more than 2.6 lbs / 1.2 kg, for ultra-realistic inertia and Force Feedback. Detachable FERRARI 458 CHALLENGE replica wheel for T500 RS, T300RS, T300 Ferrari GTE, TX Racing Wheel Ferrari 458 Italia Edition. Reinforced rubber texture on the wheel’s entire circumference. Brushed metal central spokes (2 mm thick) with metallic paint Weighs more than 2.6 lbs / 1.2 kg, for ultra-realistic inertia and Force Feedback.